How can such a small person require so much stuff? 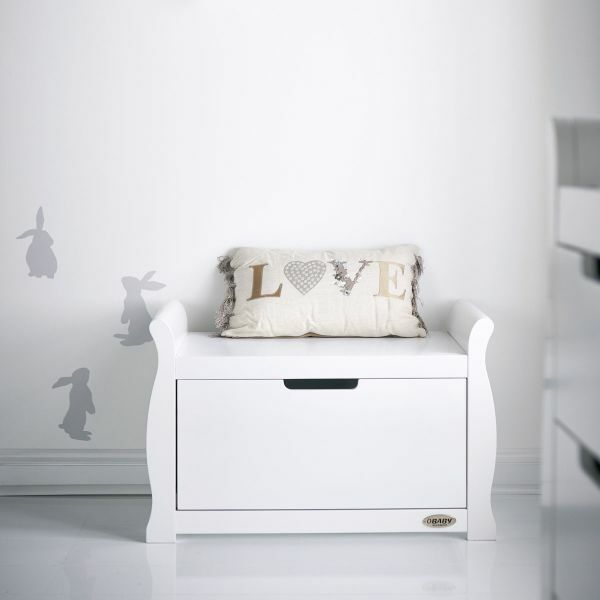 Whatever size your nursery, storage is your best friend and it’s wise to choose furniture that really maximises the space that you have. At first, a chest of drawers or changing station is the easiest way to store all your beautiful new babies clothes, nappies and muslins. Chests of drawers provide you with lots of easy to access storage (and ours even has soft close drawers to protect little fingers). Invest in a chest of drawers that can double up as a changing table by adding a securable padded mat to the top. As your little one grows, it might be time to add a wardrobe as it gives you lots of room for clothes and bedding without taking up too much floor space. 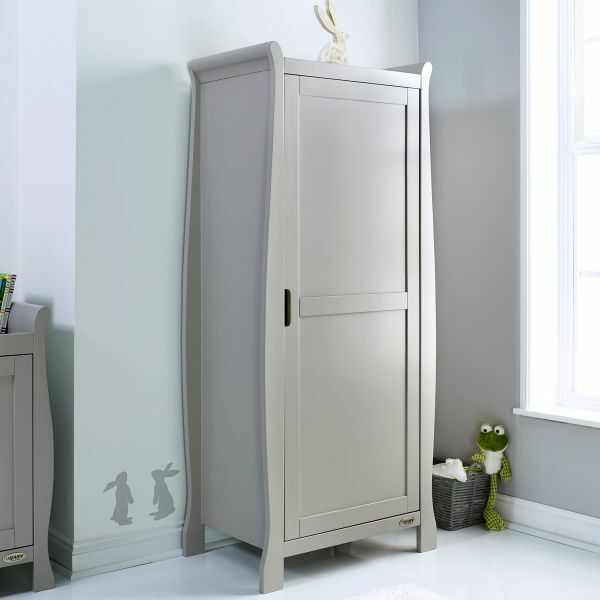 Choose a single wardrobe if your nursery is on the smaller side or future proof your storage needs with a more traditional double door version. A nursery wardrobe with drawers will have the option of hanging and shelf space too but whatever size you choose, it’s all about maximizing the space inside that counts. With shelves, hanging racks, bins, baskets, and other containers, you can keep everything up and out of the way. If you don’t use clear storage containers, be sure to use labels so you can find items you need quickly. If you have space on top of the wardrobe, pack anything you don’t use very often into plastic drawers or baskets and keep them on top. Use the height of the room and choose tall rather than wide furniture. 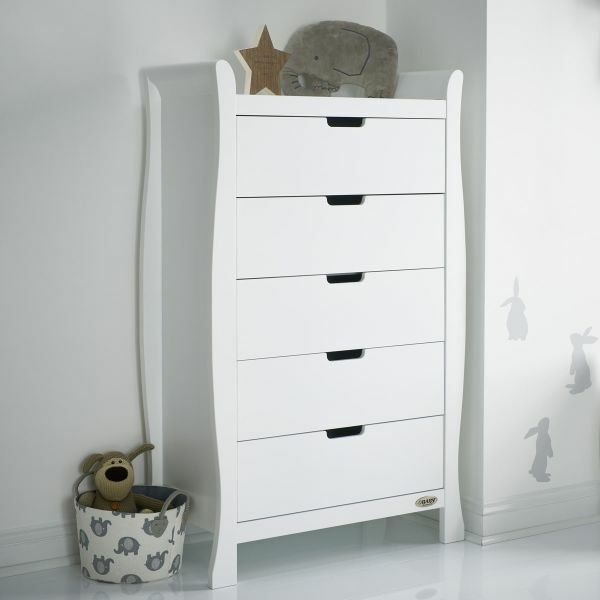 A tallboy has several deep drawers, perfect for storing some of those handy essentials, you can keep everything in your nursery organised with no fuss. For safety, make sure you secure tall furniture to the wall with a bracket or two. When you have a small nursery, every square inch counts. Is there space under the crib? Choose a cot with a built-in drawer or buy baskets or boxes that you can slide underneath. If your nursery door swings in, consider reversing the direction​ or install an over-the-door storage rack to make use of the narrow space behind. Wall hooks are a great way to make use of vertical space. Hang large canvas bags from each knob, and fill them with toys, nappies or babygrows - anything! Shelves and storage baskets in the nursery can add a stylish finishing touch and are a great solution for tidying away toys and teddies. Shelves offer a wealth of storage without stealing an inch of precious floor space. They can even be used in place of furniture - a table-height shelf next to your rocker could hold a small lamp and a few bedtime stories. You can also use wall storage as a way to decorate your nursery. Your baby may only have a few books to begin with, but their library will grow and a bookcase offers plenty of storage space. Customise shelves by adding storage boxes, picture frames or plant pots for a personalised look. A toy box is an ideal place to store all your child's toys and books, bringing a little organisation to play time. The spacious chest has plenty of room for all those play things and works equally well for additional nursery essentials like bedding and nappy changing essentials. Alternatively, multi-functional furniture, such as a storage bench that you can use both as a toy chest and a seat, saves space and money.